It's amazing what a difference a goat can make! 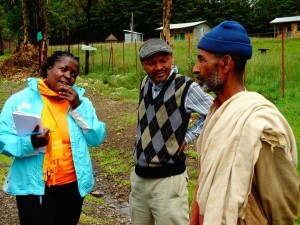 Here comes an update from the breathtaking Ethiopian highlands! Amboka Wameyo, Regional Program Manager-Africa and Gebriel Galatis, Country Representative for Ethiopia, are on the road visiting the small communities of Debre Sina and Debre Berhan in the Amhara Region of Ethiopia. This visit is giving Amboka the opportunity to meet quite a few CFTC beneficiaries for the first time – and just as I was inspired earlier this year, she is also inspired by their strength and resourcefulness as they face and overcome adversity each day. Aug 28, 2012, Debre Sina, Ethiopia–I woke up to a very chilly morning and longed for the 30 degree temperatures I had left in Toronto. I had spent a cold night in Debre Berhan in the Amhara Region in the Ethiopian highlands to the north of the capital of Addis. Today, our agenda was to visit selected towns and villages in neighbouring Debre Sina to speak with community members about their participation in projects implemented by CFTC’s partner, Emmanuel Development Association (EDA). 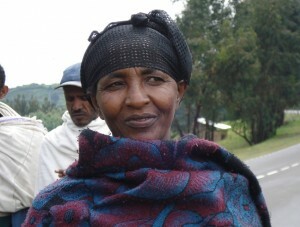 Membere Zike - mother of three and beneficiary of EDA's small ruminants program. As background, EDA coordinates integrated development projects focusing on a cross-section of issues including food security and improving local livelihoods. Since 2009, CFTC has provided direct financial and technical support to EDA’s livelihoods program to coordinate the purchase sheep and goats for community members in need. We started off by driving 60 km north to the town of Debre Sina. The first person we met was Membere Zike. Membere is, for all intents and purposes, a single mother. She was married once but her husband left for military assignment in 1990 and has never returned. Membere has three children: two adult sons and a 14-year-old daughter. With a loan of 600 birr (about $35, payable in full after three years), Membere purchased two sheep. Today, she has six animals. CFTC’s Amboka Wameyo (left) and EDA representative with Ato Kidane (right). We then met Ato Kidane, a 65-year-old father of five children, aged between two and 15 years. To him, his animals are a form of investment like a savings account. When the family is in need of money, one of the animals can be sold to purchase the needed items. For example, he sold two animals and bought clothes for his children and paid for their school expenses. Shibire Damena’s success story was repeated by other women we met. 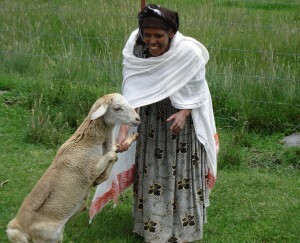 When CFTC support commenced in 2009, Shibire received 600 Birr ($35) and purchased two sheep. Today she has sold three sheep, lost only two to disease and has eight sheep still alive! Shibire Damena - just one of the many women whose lives have been dramatically improved by the EDA small ruminants program. We found many intriguing stories about community members who started off rearing sheep but who converted the sheep into cash and made other long-term investments. Getachew initially purchased two sheep for his 600 birr. After his sheep had multiplied to a good number, he sold some of them and bought a five-year bond at the Commercial Bank of Debra Sina. 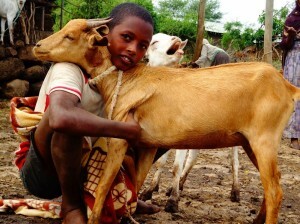 Tesfaye Abate, on the other hand, sold three sheep to finalize his distance education program. Both Getachew and Tesfaye used returns from the sheep to invest in ventures that would provide economic returns in the longer term. In two villages found in the lowlands of the Rift Valley, Safiberat Village and Abaye-Atir Village, community members have organized themselves into Village Savings & Loans Associations (VSLAs) with the support of the local government. These VSLAs are places where community members come to learn about the importance of saving and financial management, and then learn how to run the association on their own, with training in bookkeeping and management. CFTC has contributed goats to members of these associations as an asset that can be ‘multiplied’ and to generate income. The venture has only just started in these two towns (2011) but already community members are expecting positive returns. 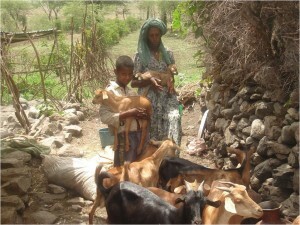 Mother and son with goat herd that provides livelihood and food security. After a full day of speaking to small livestock farmers, I am convinced that the CFTC support through the livestock project has generated positive impact. However, the CFTC team also provided critical feedback to our partner EDA at the end of the visit to help them to strengthen and grow the program for greater future success. This feedback and the learning process experienced through these kinds of field visits help improve CFTC-supported livelihood and food security programming going forward. This process also helps CFTC to learn how to better support local capacity building to ensure that development is community-led and positioned for long-term, sustainable results.